Selling a used car? Don't forget to put a For Sale sign in your window advertising the car. It's going to attract attention for your car on a consistent basis from people that find your car attractive in the first place. There is one absolutely important caveat to add. Only do this if it does not conflict with any ​local zoning laws. In Greenwich, Conn., for example, it can result in a $45 fine. Also, there are areas around the U.S. where it is illegal to put a for sale sign in your car window. There are good reasons for and against such laws, but frankly, individual sellers who sell a car one time should not be punished this way. 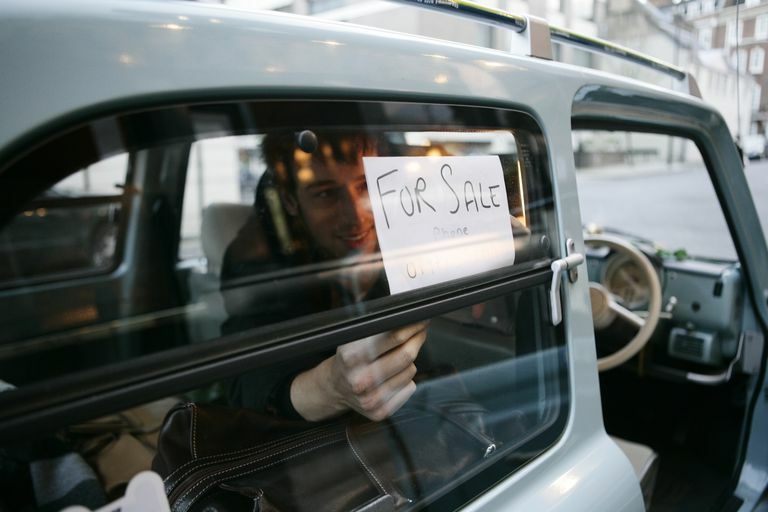 Think about the times you've seen a "For Sale" sign in a used car's window. It piques a little bit of curiosity on your part. The sign makes you look over the car and it's one of the most important things you can do to sell your car. Why? It's an eye-grabber. Department stores are full of similar signs. Most people are drawn to a place like Macy's because of the advertising, but once they're inside they engage in impulse buys because of signs they see. Don't be a penny pincher and attempt to make your own sign. Get a "For Sale" sign at your local hardware store or sign shop. Buy four signs—one to go in the back and two to keep in the side windows all the time; the fourth comes out from behind the passenger side sun visor whenever you park. With this strategy, you're covered from all angles. Nobody will notice signs on the inside of heavily tinted windows, so if you have blacked-out windows on your car, tape the signs to the outside of the window. Use heavy, clear packing tape to make them waterproof. To drum up interest in your car, invest $3.95 in a professional looking window sticker for your used car. WindowSticker.us will create a pretty nifty looking window sticker for you. Make sure your sign is done right, though. It has to include your phone number - but make sure it's a cell phone number where people can reach you at all hours of the day. You have to strike while the iron is hot. People who reach voicemail probably won't leave a message and the sale is lost forever. There's a big advantage to making a cell phone number the primary contact: caller ID. You'll have a record of how to get in touch with folks if their message gets garbled. Plus, it's another safety feature because you have an additional record of potential buyers. Too cheap to spring for a window sticker? You can get a free fuel economy label via FuelEconomy.gov that's pretty neat looking. Don't waste people's time—the price needs to be displayed prominently, even if you're not doing the window sticker. Be upfront and tell them what you want for the car. Don't write "Call For Price." If the price is negotiable, add "Or Best Offer" after your ideal price on the sign. If the price isn't negotiable, then you need to write "Firm" at the end. Don't cram a lot of other information onto the sign. Keep it simple. Tease people with the basics and let your car do the rest.